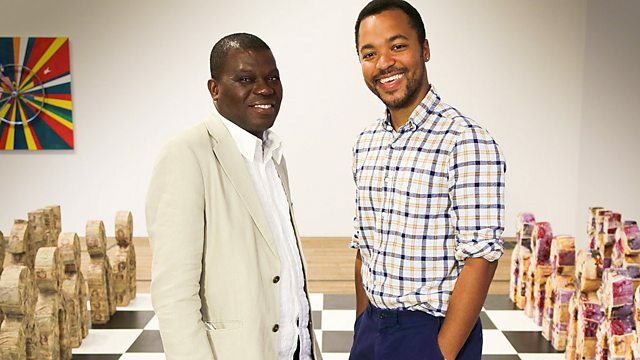 BBC Two - The Culture Show, 2013/2014, Who Are You Calling an African Artist? Who Are You Calling an African Artist? Morgan Quaintance examines the careers and personal stories of two artists, visionary modernist Ibrahim El-Salahi and contemporary free-thinker Meschac Gaba. This summer, Tate Modern has opened its doors to Africa, dedicating an entire wing to two of the most important artists working today: 82-year-old visionary modernist Ibrahim El-Salahi and contemporary free-thinker Meschac Gaba. Writer and curator Morgan Quaintance discovers their extraordinary personal stories, and a struggle for recognition that spans six decades. Studying at the Slade in the 1950s, Ibrahim El-Salahi returned home with a crate full of modern art, to meet a stony faced public in Sudan. Reconciling the language of modernism with the culture of his heritage, he found a powerful new way to express the dreams and ambitions of African independence. It was to lead to imprisonment, exile and eventually freedom. Yet El-Salahi, along with Africa's modern art tradition, has been ignored by the museums and institutions of the West, to the shock of Meschac Gaba, arriving in Amsterdam on a scholarship in 1996. His response was to create his own Museum of Contemporary African Art - an idea for a museum that did not yet exist.